This week has been a bit of a hectic one, with work Christmas parties and various drinks/dinners and a wonderful trip to the ballet…all amazing fun, but boy is a lay-in needed! For the past few days I have been reaching for anything I can get my hands on beauty wise to hide the fact that I feel somewhere between a zombie and roadkill… one of the quickest and easiest ways I can pretend I am 100% awake is to refresh the eyes… and whilst there’s not much out there that beats a good nights sleep. These two eye roll-on products deliver the cooling/depuffing effect that can help fake a few more hours than actually happened. Essentially, on first impressions there’s not a whole lot of difference between the two – both contain a clear cool gel, that is applied by using the cool metal roller ball to apply/massage the eye area (not just under-eye – use on the upper lid too, really refreshing) to deliver a quick hydration hit (emphasis on quick) and an instant refresh, cooling feeling. Of course the price difference between these is the main difference, if I was being really picky I’d say the Origins feels more hydrating for slightly longer but hydration isn’t really what these are about as it’s more about cooling and de-puffing than moisture. I tend to have my Origins at home and take the Simple one out and about with me (as if I was too accidentally misplace or loose one I’d prefer it to be the cheaper one!) but these are very similar products – both good at what they promise! I like Simple! I haven’t seen this product in stores but I will look harder. 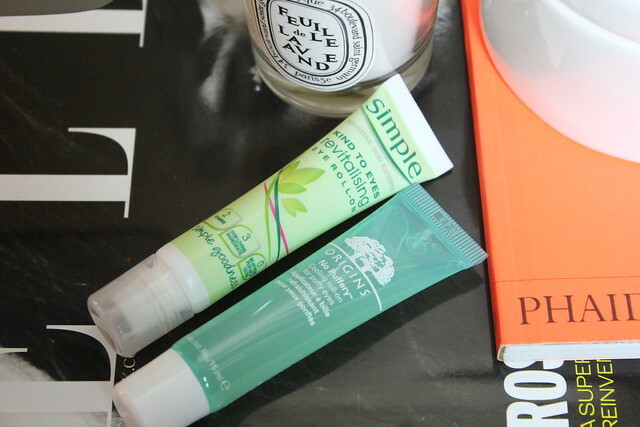 I’ve been spending quite a bit of money on eye creams lately 😛 Thanks for the great post!